This entry is being re-posted from a previous post. While working on a family history a few years ago, a wonderful old photo of my family surfaced. My grandma was one of eleven children, and the photograph was one of the few times all eleven brothers and sisters, and some extended family were all together in one place. 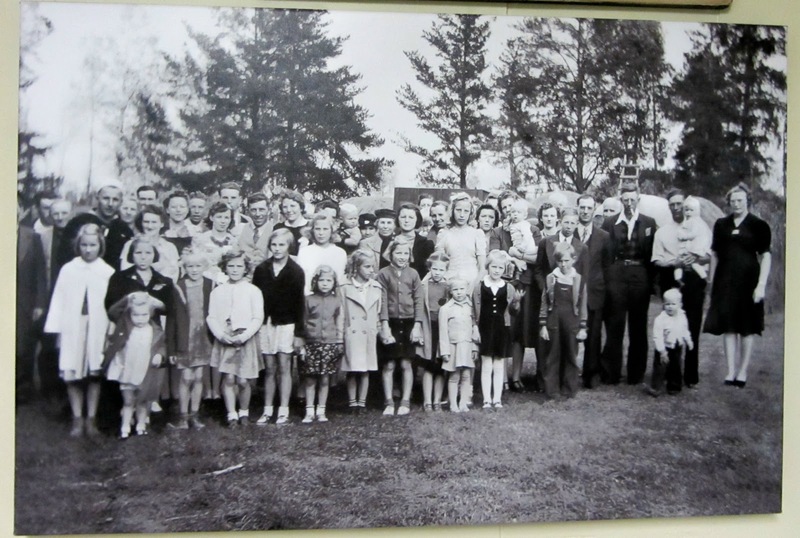 The occasion, a 1940's family gathering for a WWII navy seaman. The sailor, Art, is one of the eleven children. Also making the photo endearing, are my 30 something year old grandma and grandpa, and my mom and her two sisters as children. I was planning to just enlarge the photo, when I saw an advertisement for Canvas on Demand. I scanned and emailed the company my old picture, and they shot me back a price quote, and some advise about how much I could enlarge the canvas without losing photo clarity. It may seem kind of unlikely, but I decided to hang my large black and white canvas in my laundry room. First of all, my laundry room is right off from my kitchen, and sort of the center of the house. The laundry room has two doorways, so someone is always walking through it. Secondly, I have a breaker box and some visible wall patching from the old fuse box on that wall. I used to hang a large tapestry over the area, but I wanted something different. I was and still am very pleased with the quality of the canvas and the retouching. The photo was very old and had a slight blurriness at the very edges but it sort of worked. Like the center was crisp and clear and the edges were a soft focus. I also had an old school photograph of my mom made into a portrait for a Christmas gift. A fun little photo of a shy? little school girl in the thirties. The following is copied from the Canvas on Demand's website - Vintage Customer Showcase. 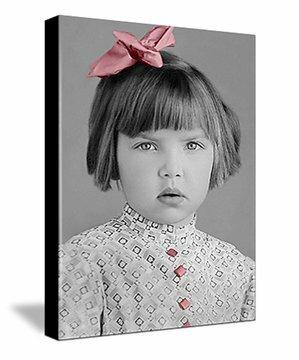 The retouching was great and the special effects of pink on the buttons and bow made them pop on the black and white portrait. My mom's school girl picture from the 1930's that we recently discovered in an aunt's photograph collection. I purchased the photo from Canvas on Demand for a Christmas Present for my mom. She loved the picture! My mom's school girl picture from the 1930's, that we recently discovered in an aunt's photograph collection. Purchased the photo from Canvas on Demand for a Christmas Present for my mom. She loved the picture! I just love that photo of that darling girl. I have some photos especially of my mom and I from the 70s that are so faded that I need to restore. That group shot is amazing -- looks fabulous as a canvas. Your mom's pic is adorable -- you did a fantastic job. Love them both. They turned out beautifully. 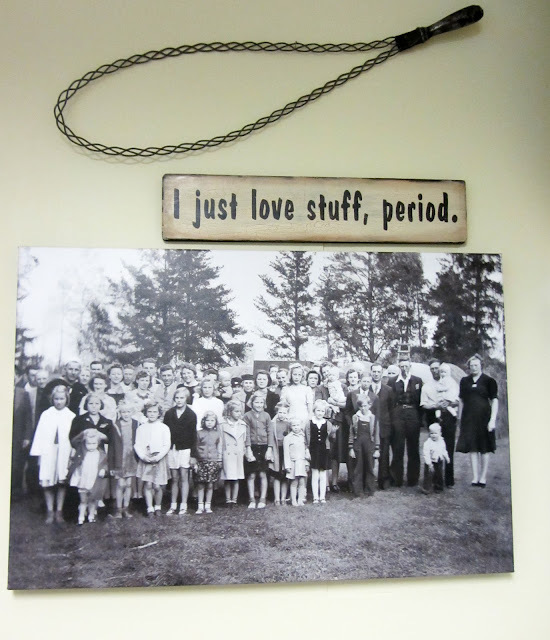 I think that is a great way to display vintage photos. I have a few that I would like to try this with. Love the picture of your mom. RE: Your previous post....Your decorating style is clean and interesting. I enjoy that. I love this idea! My oldest daughter had a canvas made of a close-up of their son and it looks like a portrait. Your mom's photo is so sweet! The pink bow is perfect! That is such a great idea. The photos are gorgeous. Thanks for sharing. I love this idea and vintage photos. The one with the group sot is great. What beautiful and special pictures! Thanks for sharing - your posts have been great :) Have a wonderful day! That family shot is amazing and what a treasure. Love that you blew it up so large and made it a statement piece. Your mom's school photo is just darling. Love the look on her face.